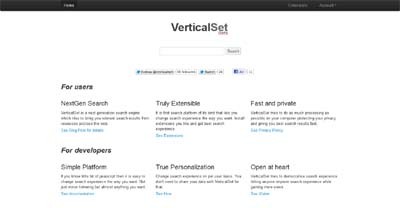 VerticalSet is a extensible search engine that provides high quality search results from variety of sources on web. Using different search extensions you can tailor your search experience to suit your needs. Under the hood it is a platform that lets anyone take control of search experience. It is a platform rather than a search engine. It is so simple to develop on it that you can develop an extension to improve significant percentage of queries within few hours. It is a distributed search engine taking advantage of recent web technologies and familiar to most of developers. Open nature of it is also boon for content providers. Thus developers, content providers and more importantly users stand to benefit from this.